For all dog lovers, there's a very special film to be broadcast on BBC2 at 18:10 on Sunday 20th January. I thought that your members would enjoy watching this special dog story and seeing that even when wild, dogs really are caring, trusting and incredibly loyal. There is more information about the film - which is a true story - below the picture. 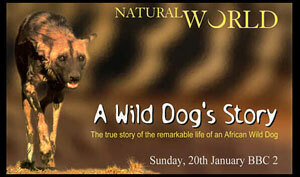 There is also more information on Wild Dogs themselves. The more people that watch this incredible film, the better for these highly endangered animals. Please be kind enough to forward this email to all your subscribers. The poignant, true story of the life of one heroic African Wild Dog named "Newky" - an intimate tale of struggle, endurance and triumph, and of one dog's extraordinary spirit to win through against almost impossible odds. "Newky" was an African Wild Dog, whose exceptional life was scientifically documented over a period of five years by wild dog researcher Dr. J. Weldon "Tico" McNutt. Now, this emotive natural history film brings Newky's story back to life, in a faithful and detailed recreation of his experiences. Through Tico's personal recollections, we follow the dramatic account of Newky's life, in a moving, true story that is both heartbreaking and important to understanding the challenges wild dogs face as a species. Set against the spectacular wilderness of Botswana's Okavango delta, this poignant tale follows Newky's life from the dangers and joys of puppy-hood, through the loss of his siblings in tense encounters with lions, and into the trials of adulthood. But even being a strong adult dog brings a life of danger, hardship and conflict. In a tragic twist of fate, Newky's entire pack is wiped out by a mysterious disease epidemic. Alone, he is forced to endure dangers that normally would be met by a strong, coherent pack, as he searches for months trying to find others of his own kind. Newky at last finds a mate, another lone survivor of the epidemic, only to endure tragedy once again when she is killed by a farmer's bullet. Newky remains undaunted, and in the end, succeeds in fathering a new generation of wild dogs. Before then, he must not only find another wild dog pack, but also compete for acceptance and overthrow the alpha male. This is a tale of struggle, endurance and triumph, and of one dog's extraordinary spirit to win through against almost impossible odds. Above all, it is an emotionally powerful, true story, in which, through Newky's remarkable life, we learn of the challenges facing one of the worlds most endangered and fascinating social mammals. Kenyan born wildlife cameraman Mike Holding first came to Botswana 20 years ago. For the last 5 years he and film producer Tania Jenkins (better known as 'TJ') have been with the remaining descendants of Newky's pack, which resulted in the filmmakers achieving a unique, personal bond with this particular group of wild dogs. That close relationship allowed them unprecedented access to the dog's daily lives, and the result is some of the most intimate footage of wild dog behaviour ever filmed. African wild dogs, Lycaon pictus, have been eliminated from most of their former ranges and today only three viable breeding populations are left in the wild. Altogether there are thought to be as few as 3000 individuals, living mainly in South Africa's Kruger Park, Tanzania's Selous Game Reserve, and in Northern Botswana. More endangered than elephants, than cheetah, than rhino, are African wild dogs and the reason for that is that space is the greatest criterion on which they rely to live their lives. Says Mike Holding, "Historically they've been persecuted almost to the point of extinction and are probably one of the most misunderstood social mammals on the planet. They're seen as vicious wanton killers, they're seen as expedient, and nasty, and a threat. But there's little historical evidence to suggest that they have ever been a significant threat to livestock, and there's not a single recorded incident in Africa of anyone having ever been attacked by a wild dog. They are, of all the social mammals, one of the few examples of an animal whose entire social system and structure relies not on dominance but on submissiveness, on altruism, on caring for the young, on caring for the injured, and on maintaining a cohesive, co-operative social structure that allows the pack to benefit. They foster non-aggression, it's built into their genes and their behaviour and that's pretty amazing." TJ concludes, "If the film can touch one or two lives as the wild dogs have touched mine, then we've done enough. If one or two people can say 'hey, there's a different way of living, there's a different way of being', and be touched in their soul so that their soul wants to live differently, then we've done way more than make a 'Natural World' film." For more information contact: Tania Jenkins ... better known as "TJ"